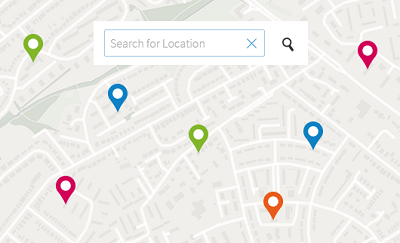 Our secure, scalable, and resilient address look-up web service, OS Places API lets you search the UK's most comprehensive online address database. With OS Places API, managing customer data is a breeze. Lightning-quick postcode and address search means your records are accurate and customer deliveries should always get to the right front door. For customer data managers, the address matching and cleansing tools in OS Places API let you build trust in your information. They make it simple to correct errors from misheard phone calls, for example, so you get fewer duplicate records. When an incident happens, control room staff need to know which properties are closest. OS Places’ geosearch tool gives instant answers. This helps create the common operating picture that’s vital for the emergency services. It's free to evaluate OS APIs for your internal business use or to develop products and services prior to commercialisation. Get started using OS APIs straight away without needing to hold an existing OS data licence. Premium Service plans are for 12 months, paid in advance. You can license this data free to evaluate it for your internal business use or to develop products and services prior to commercialisation. Premium plans are designed for internal business use only. Choose our plans for existing data licensees to use our APIs in your own products and services, or to distribute it. Members of Public Sector Mapping Agreements should use our plans for existing data licensees. Assumes user signed up to Royal Mail® Public Sector Licence (PSL), meaning user will not have to pay for data or Postcode Address File (PAF®) fees. Improve efficiency – use OS Places to verify the data you’re capturing against Ordnance Survey’s core AddressBase® Premium dataset. Edit out-of-date (or partial) details of residential and commercial properties in your own databases and make it personal: add shareable URPNs to existing features, such as post-boxes or warehouses. With OS Places, you’ll have instant, reliable search results to make deduping and cleansing address data easier for your business. Improve efficiency, guarantee accuracy and reduce costs throughout. 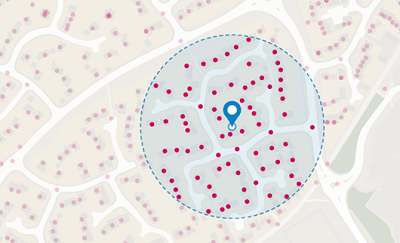 Use postcodes and UPRNs or text strings to identify and match your targets – get information about residential and commercial properties quickly and easily. Make sure OS Places is driving your applications, and users will have access to some of the most sophisticated online GeoSearch services. You may be a large business, looking for APIs to integrate with your own GIS. Perhaps you’re an independent developer who wants to create a new web or mobile app. Either way, you’re welcome to trial all three features of the OS Places API free of charge. 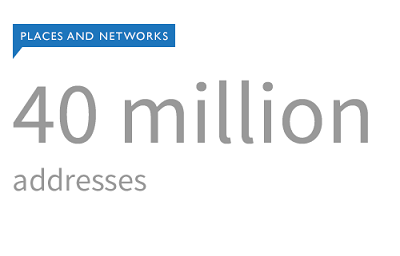 All we ask is that you don’t go over 10,000 transactions (combined, across all three features). Geosearch – enabling finds of addresses or reverse geocoding via radius search, or by drawing a boundary box. Matching & Cleansing – integrating with existing systems to enable faster, more accurate postcode look-ups and autocompletion on websites and Enterprise customer service systems. Capture & Verification – checking address data, quickly and reliably, to enable deduping of entries in already populated databases and provide verified uniformity. OS Places API derives data from our AddressBase Premium dataset – Great Britain’s most detailed view of addresses and their life cycles, including everything from planning to creation to change of use and demolition. Up to date cross references to our large-scale data, such as OS MasterMap Topography Layer and Integrated Transport Network Layer via the TOID – but also references to objects that don’t have postal addresses, as well as coordinates that have been verified via our surveyors. Data from the Local Land and Property Gazetteer and One Scotland Gazetteer, which includes information captured under statutory obligation through the SNN process. The Royal Mail’s data, providing a Postcode Address File (PAF) containing the UDPRN and the delivery point address record. The Valuation Office Agency, which provides cross references to council tax and non-domestic rates data. OS Places API won’t find general areas (such as ‘forest’), or perform bulk address matches in its off-the-shelf form. However, if bulk matching could be useful to you, please let us know. SO16 0AS is the full postcode of our head office in Southampton. But searches for Ordnance Survey at SO16 will return details showing that our address is on Adanac Drive. OS Places is a RESTful API, returning queries in either XML or JSON. The ‘find’ tool enables rapid searches of AddressBase Premium to discern ambiguous addresses, whereas the ‘match’ tool is for more granular matching and cleansing of existing address databases. There’s no need for any database management of AddressBase Premium itself. The OS Places API accesses details of addresses in Northern Ireland, but these have a few unique characteristics due to not being derived from Address Base Premium. Addresses within Northern Ireland will not have a UPRN or status, and coordinates will be ‘0.0’ due to falling outside of the British National Grid. At the OS APIs developer hub you'll find comprehensive guides, documentation and code snippets to help you start working with OS Places API as quickly as possible.